Clyst Entrance Gate - Blamphayne Sawmills Ltd. Fully planed finish with a choice of soft or hard wood. 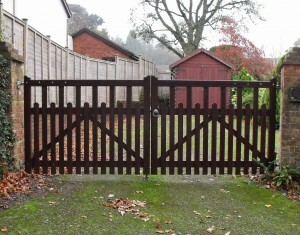 Its unusual design makes it stand out from other gates. Ideal in pairs this makes a very attractive entrance or garden gate. Standard sizes range from 0.9m (3′) to 3.0m (10′).